I’m sure we’ve all seen pictures or videos of them – little R2D2 wannabes running up and down the factory floor, doing their masters’ bidding as they retrieve this thing and put that thing away. Like magic, they wander around the warehouse as if they knew where they were going. Well, the fact is, they don’t know where they’re going. And they don’t have nearly the self-sufficiency of the iconic Star Trek* supporting character. In a discussion at Semicon West with Dr. Matthias Merten of MetraLabs Automation and Dr. Karli Hantzschmann of Roth & Rau-Ortner-Ortner, I got to learn some of the limitations of the current breed of factory robot as they demonstrated their next-generation droid, dubbed Scout. Roth & Rau-Ortner specializes in factory automation solutions and MetraLabs develops small, automated robots. And what was different about their new little pride and joy was how they had equipped it to get around – not only in a dirty warehouse, but, in fact, in a Class 1 cleanroom (the cleanest open-air category; after that, the clean areas are enclosed in the machinery). Older robots apparently aren’t as clever about getting around as they might look. Because we typically see well-produced video shot under ideal conditions, it looks like the robot is merrily navigating its way around. But it’s not navigating. It’s just, well, following its nose. There’s a line painted on the floor. All it’s doing is following the line. What happens if someone or something gets in the way? I suppose a really bad robot would just run into it, but realistically, it will simply stop and wait until either the obstruction goes away or you paint a new line around the obstruction. Likewise if you want to change its route: you have to repaint the floor. What differentiates Scout is its ability to truly navigate, and, to do that, it’s taken some pages from pedestrian navigation to some extent, but it relies also on its own unique set of sensors to inform it about its surroundings. Indoor navigation relies on an array of sensors to track motion, along with other cues like wireless beacons and internal maps; a data fusion algorithm munges it all together into something meaningful. Scout works similarly, although motion detection is done differently and there are no overt beacons. Scout does use a map. But rather than relying on its host factory to have already digitized and made available a map, it builds its own. When introducing Scout to a new factory floor, you start by leading it around the factory; Scout builds an internal map of what’s where. Doing that requires Scout to be able to keep track of where it is. While typical pedestrian navigation solutions rely on the IMUs in your phone or other gadget, Scout uses its wheels. That’s analogous to using a shoe sensor to track pedestrian motion. But, as with an IMU, it’s not completely free of drift; left in isolation for long enough, errors would accumulate. But Scout doesn’t operate in isolation: it also has an array of other sensors to help to keep it on track. Specifically for this, it has a ranging laser, which provides 2D information with a 270° field of view. That laser is backed up by an ultrasonic detector that sees where the walls are. These sensors help with the navigation part, but Scout also has to deal with obstructions or items with irregular contours. Towards the bottom is a rubber bumper that acts as a collision detector of last resort. This bumper has to be the furthest-out thing on the robot; nothing else is allowed to extend beyond it; the idea is that, if your most-extended feature is a collision detector, then you won’t risk breaking some long arm that hit something before the bumper did. But that’s no guarantee; the bumper detects only things it runs into at the bottom. Some obstructions may have higher-up protuberances – like a keyboard sticking out of some equipment. Scout could run into the keyboard before the bumper hit whatever the keyboard was attached to. So there’s a 3D camera-based system used to detect such irregular shapes. The combination of all of these sensors is intended to make Scout robust enough to run autonomously and adaptively. Its motion is accurate to about 2 cm. An adaptive aspect comes into play if Scout’s intended route becomes blocked. At first, it can assume that it’s a temporary blockage and wait until it moves (the wait time is programmable). But it can then give up and calculate a new route. This doesn’t mean redoing the internal map; it has the capability of keeping a temporary map to accommodate obstructions or other temporary diversions, reverting back to the permanent map (and thereby avoiding a new training session) when everything gets back to normal. You can dial up how long the temporary map is in place, and, if wireless connectivity is installed, then Scout can share the map change with the other robots . It comes equipped with a transmitter that can open doors. You can also plug in special behaviors, like the ability to go through a curtain. 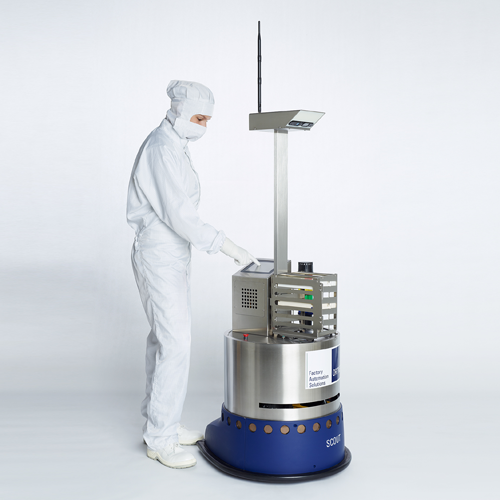 Of course, since this is operating in a semiconductor cleanroom, the materials have been very carefully selected to be compatible with a fab. And all moving parts are internal and isolated from the environment to avoid particles leaking out. The only place it’s open is the bottom, and the airflow is ceiling-to-floor, meaning that anything escaping from the bottom should disappear quickly without contaminating anything. Although this is intended for a cleanroom, they have also operated it in public areas, which are a far more difficult environment to handle. A big part of the challenge is the uncontrolled, unpredictable biological units called people – in particular the immature, even less predictable young versions and their detritus like bikes and toys – that make for a white-knuckle ride for a poor robot trying to abide by their prime directive to hurt no humans. Success in the wild like this makes operation in a factory seem easy. As to future developments, they are looking at adding handling – a grasper of some sort – to Scout. This is more than just bolting on an accessory. First, it can’t extend out further than the bumper. Second, it needs far better motion accuracy than the current navigation provides – on the order of a millimeter or less – in order to grasp and manipulate things properly. They will also be adapting it to accept more complex-shaped payloads while maintaining its clean characteristics. They’re hoping for a demo prototype of the next edition sometime before the end of the year. Who knows… there may be a movie in its future. * KIDDING! Star Wars. Just wanted to see how many of you I could get to fall out of your seats. Good to know there’s something that will make you people get up out of your chairs and get MAD!! What do you think about Scout’s robotic navigational capabilities?